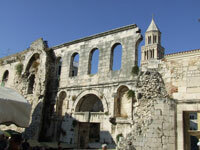 Split is an ancient and attractive city with centuries of history bolstering its modern appeal. As with many Croatian cities, the richest concentration of tourist attractions in Split can be found in the oldest part of the city around the famous Diocletian's Palace. This magnificent palace was built by the Roman Emperor Diocletian in 303 AD and it is a privilege to explore. There are numerous walking tours on offer for the palace complex and the surrounding old area of the city, which can be very informative and entertaining. The impressive Cathedral of St Domnius and a climb up its rather scary bell tower, which earns you spectacular views of the area, will often feature on these tours. Another attraction not to be missed is the remarkable clock by West Gate which has been keeping time in the city for more than a century. There are lots of other things to see and do in Split, with highlights including the Archaeological Museum, the oldest museum in Croatia. This museum collects and displays artefacts from Split's long history and is a joy for history buffs. On a more contemporary note, travellers will enjoy a stroll along Riva Harbour which has a pretty promenade lined with bars. It's a great place to meet locals who favour the spot for evening walks and recreation. Split is also a convenient base for excursions to myriad beautiful islands and villages, and visitors are spoilt for choice when it comes to daytrips. The nearby islands of Brac and Hvar offer stunning beaches and charming little towns, and the coastal villages of Makarska and Sibenik are enduring Croatian favourites. The magical walled town of Trogir, a UNESCO World Heritage Site, is situated on a tiny island between Ciovo and the mainland, and tops the list of many a Croatian travel itinerary.